Yeddy will have to do a Modi to rescue Karnataka’s finances. The BJP’s long-time dream of opening its account in the South has finally come true. The saffron party has come to power in Karnataka on its own. Will that catapult Karnataka into the exalted company of Gujarat in terms of growth and economic progress? B.S. Yeddyurappa, under whose leadership BJP ascended to power, often said he would emulate the Gujarat model to replicate its success in his state if voted to power.But can he? 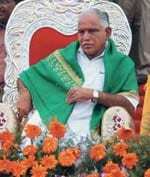 Yeddyurappa rode his party to Vidhana Soudha on the back of a legion of promises. For instance, he has promised free electricity to farmers and crop loans at a rate of interest of 3 per cent. Free power alone will drain the government of about Rs 2,700 crore, not to speak of other populist promises. Meeting the BJP’s poll commitments itself will turn out to be a Herculean task for Yeddyurappa; there is every risk of the government programmes on health, agriculture and other social sectors devouring all revenues of the state. As it is, a few sources of revenues have either dried or thinned; arrack and lotteries don’t yield anything as they don’t exist any longer; so is the case with a special entry tax after it was struck down by the High Court. The income from Central Sales Tax (CST) as well as entry tax on crude has declined after their rates were cut, last year. Officials managing Karnataka’s finances note that increased spending on populist schemes would come at the cost of the state’s financial and investment institutions, which may not receive much support. There is also the risk of free power to farmers driving away potential investors in power generation. Experts see a much bigger threat from increased spending on programmes, some of which might just blow up tax revenues instead of creating durable assets. Bangalore and parts of Karnataka have huge gaps in infrastructure to plug that require massive funds. One of the BJP’s promises is to develop Bellary and Gulbarga as steel and cement zones, respectively, and Bangalore /Mysore as an IT/BT hub. There is, however, one silver lining that investors might see. The Gujarat administration is known not just for its infrastructure, but also for quick decisions and hassle-free clearances for industrial investments. If Karnataka’s new regime were to take a leaf out of its party government in Gujarat that will hold out some relief to investors, both existing and new.